Today was a good day for my planners. 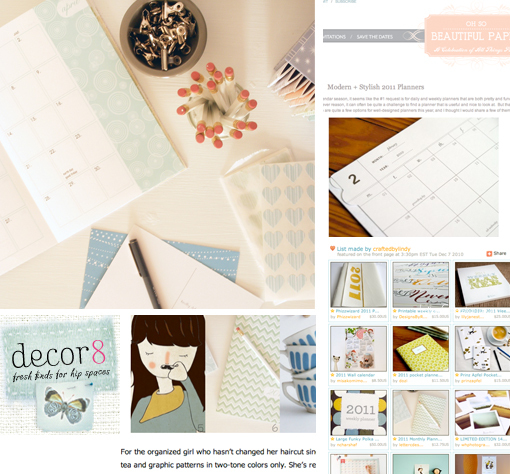 First they were mentioned on the lovely paper filled blog Oh So Beautiful Paper along with some other great planners. Next up they made it to the front page of etsy in a treasury about 2011. Lastly, Holly from Decor8 included them in her etsy take five gift guide (The description of the organized girl who my planner is perfect for is pretty funny — do you think she knows I haven’t changed my hair since fifth grade?). Looking forward to getting my calender! Happy New Year! I don’t have your planner but I just ordered/received your calendar. And I love it! I can’t wait to hang it up in our kitchen. Thanks for making such a lovely product!